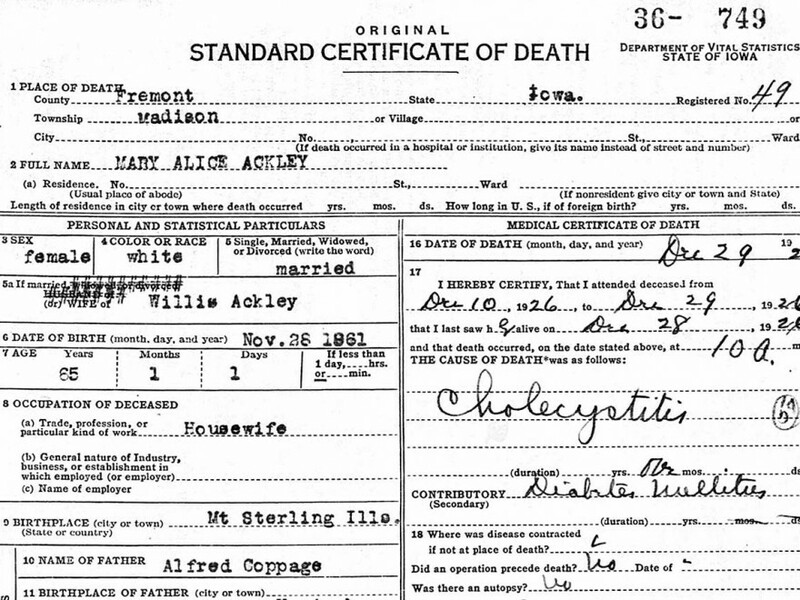 This is the death certificate for my great grandmother, Mary Alice (Coppage) Ackley. Mary Alice Ackley died on 29 Dec 1926. She was born on 28 Nov 1861 in Mt. Sterling, Illinois. She was buried on 31 Dec 1926 at Mount Olive Cemetery. Her father’s name was Alfred Coppage, and he was born in Kentucky. Her mother’s name was Emmaline Lynn and she was born in Pennsylvania. She died of Cholecystitis (apparently diabetes was a contributing factor). The original source document was obtained through Ancestry.com and is provided below (please see detailed citation information at bottom of page).